This is the basic layout – it is exactly what I used but you can change the number of columns, or the number of blocks in each column to change the size to what you like to be… but I am jumping ahead of myself. I have made only one quilt, the very first one many years ago, following a pattern. It is not that I don’t want to buy a pattern, or a book (I actually own several quilting books)… it is that I find it challenging to figure out how to cut fabrics and assemble pieces into a design… either something I saw somewhere, or a design I thought of myself. When I saw this design I was intrigued. Would I have to use paper piecing (probably wouldn’t do it then)? Would I have to do some crazy sewing? Is there a shortcut for cutting? 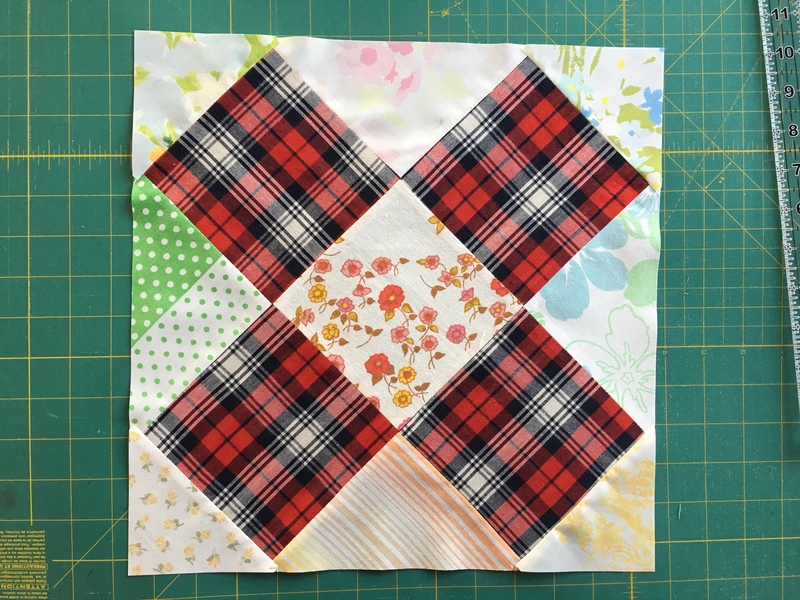 To answer the first and second one – no paper piecing, no hand sewing… Actually the basic block – made up from a hexagon and two triangles is a diamond. So all you have is straight stitching… Here is a diagram of how you assemble blocks into columns and finally columns into a quilt. The basic block is A, blocks B and C are just versions of A, for the edges of the quilt. There are two columns – I and II, that alternate to get the final design (actually there is only one column – I, column II is the same as I, just rotated by 180 degrees). So what about cutting… You will need to cut hexagons and diamonds. No triangles. Since I don’t like cutting so much – except for squares and strips, I like to minimize this step. I particularly dislike cutting using templates. So nothing like that here. So… for this particular layout, you will need 130 hexagons and 130 diamond. Dimensions are shown below. I cut my hexagons with the hexagon “ruler”, but there are ways to cut hexies even if you don;t have a template. Many tutorials have been written about this: this one from the modern quilt guild, then this one from the blue chair, and there is a tutorial on how to cut hexagons from a strip if you do have a template from jaybirdquilts. Blocks B and C are assembled in exactly the same way – except you do only one triangle and then cut the hexagon as shown (for block C, cut about 1/4 in below the corner). This entry was posted in quilting, tutorial and tagged hexagon quilt on February 5, 2013 by flekka. Clever trick on the diamonds! I sketched out this pattern after seeing so many other patterns popping up that claimed no Y-seams and the like. Wasn’t sure how I was going to size the triangles (in my case). Figured trial and error, but I see a lot of sense in your approach! Thanks for sharing this. Love how you did this.